You don’t need to travel all the way to Vegas to experience excitement, bright lights, and slot machines. A visit to your local Saint Laurent boutique allows you to experience it all - without the cigarette smoke. This iconic fashion house and lifestyle brand constantly develops some of the world's most innovative and creative concepts. Their level of design is always above and beyond, from haute couture to window displays ("vitrine"). SCPS may not be the most fashion forward, but we're certainly on point when it comes to show-stopping window displays. 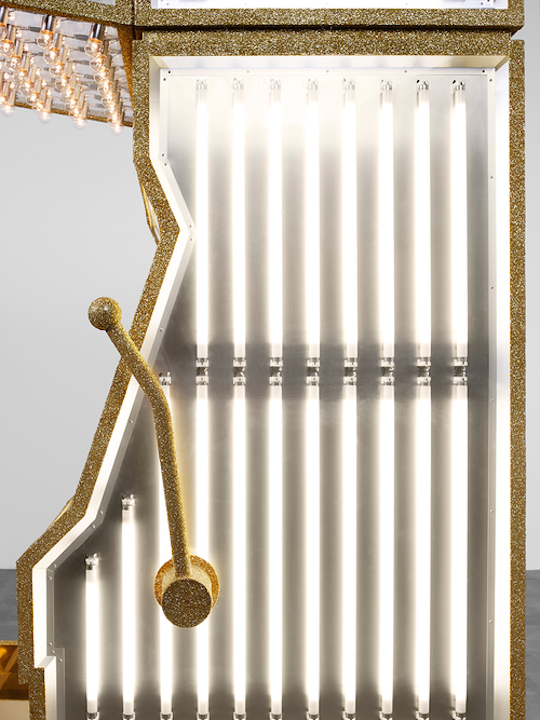 For this creative adventure, we collaborated with Saint Laurent to custom design and produce glamorous slot machines that glittered, sparkled, and whirled their fabulous products. The overall look embodied all the glittery glam of the holiday season with a touch of angst boldly flaunted by the naked wires and bulbs. Each machine was first digitally constructed within the architectural constraints of the individual boutiques, factoring in the delivery and installation process along with the electrical capacity of each international location. These larger than life machines were fully programmable and controllable with six different lighting sequences performed by over 100 custom-made light bulbs shrouding each machine. These beautiful machines debuted during the busiest times of the holiday season throughout the US, Europe, and then Asia, just in time for Chinese New Year. Our network of skilled technicians and logistic specialists tirelessly dedicated themselves within a compressed lead time. Our successful two-phase installation and launch spanned three continents, six countries, and nine cities. Needless to say these captivating pieces were a worldwide hit in the stores and on social media.